The Queen has personally promoted the use of social media by the Royal Family, in what is a digitally focused comms operation, according to Sally Osman, director of Royal Communications. Her Majesty has pushed her family to embrace social media, stating that they needed to be where people were, said Osman, who has worked for the Royal Family since 2013. "Digital is right at the centre of everything," according to Osman, whose previous roles have included stints as corporate comms director for Sony Europe, and director of comms at the BBC. "She is very supportive of the big ideas we have for social media in the future." She remarked: "The Monarchy has to be seen to be doing its job, otherwise people ask why we need it, which goes full circle back to what our job is, which is to engage people in the purpose, relevance and value of a modern Monarchy." Osman also suggested there was less bureaucracy in dealing with the Royals than people might expect. "If you have a great idea, you can send a memo to the Queen and if she says 'Yes', you’re off. She is amazing at seeing the value of doing things." 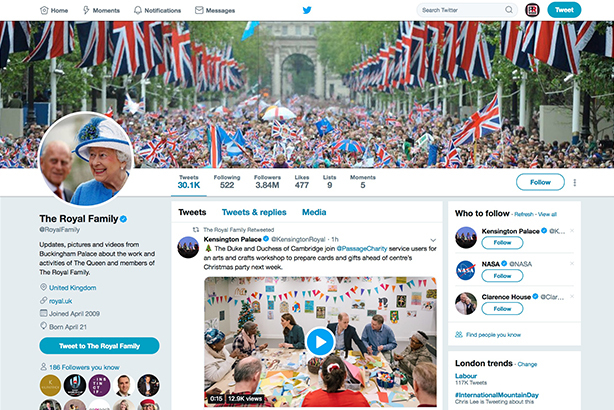 And when it comes to promoting the monarchy, "social media can also spread a bit of the magic – the views from the inside," she told CorpComms magazine last week. The Queen’s enthusiasm for social media networks as a way of promoting the Royal Family is reflected in a number of official Royal accounts on Facebook, Instagram, Twitter, and YouTube – representing more than 13 million followers and likes in total. There appears to be a demand from the public for content about the activities of the Royal Family. A recent picture posted on Instagram of the Queen at the annual diplomatic reception at Buckingham Palace generated more than 123,000 likes. And a video of the wedding of Prince Harry and Meghan Markle, on the Royal Family’s YouTube account, has been viewed more than 33m times to date.